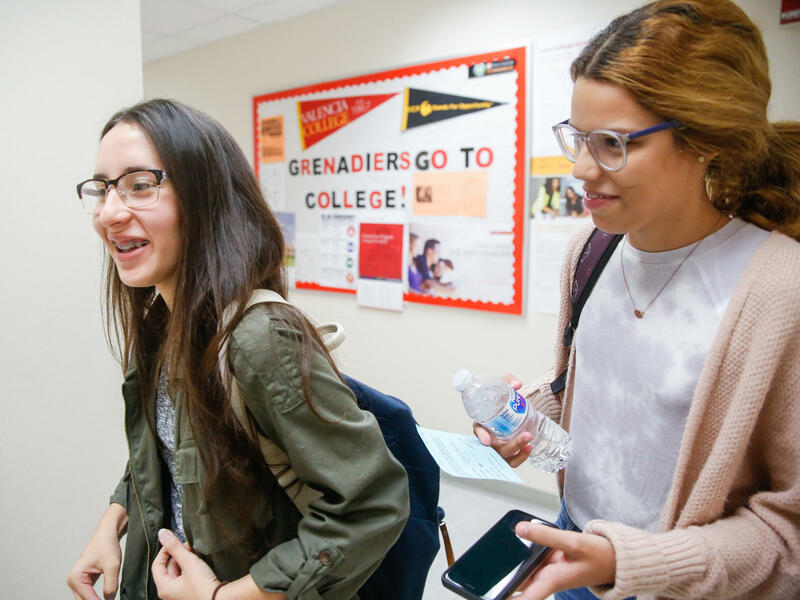 Yerianne Roldán and Zuleyka Avila are both seniors at Colonial High School in Orlando, scrambling to readjust their plans for college. 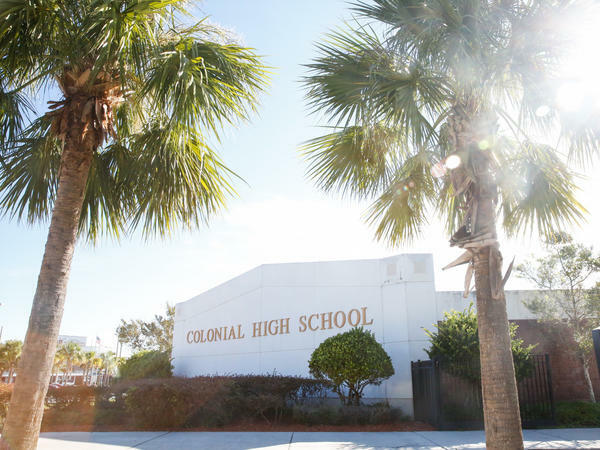 Colonial High School in Orlando has already enrolled nearly 100 students from Puerto Rico and the Virgin Islands. Avila wants to one day become a pediatrician. 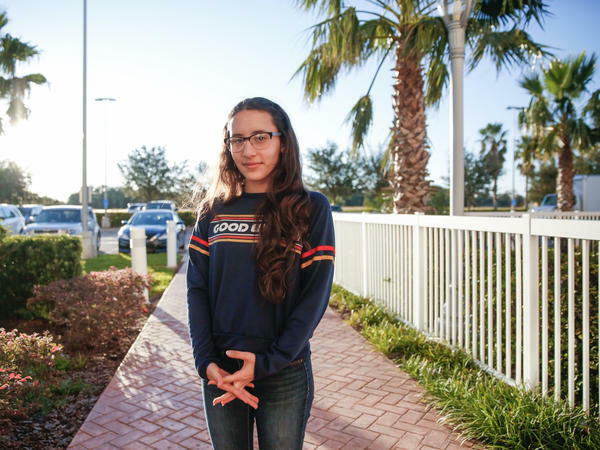 Roldán moved from Puerto Rico to Orlando with her family for school. She wants to study advertising in college. They are among the more than 168,000 people from Puerto Rico who have arrived in Florida since Oct. 3. Schools have felt that influx, with about 7,200 displaced students enrolling from Puerto Rico and the Virgin Islands — Orlando's largest district has taken in more than 2,000 of those students. Yerianne arrived a month ago. She and her family — her younger sister, her mom and her stepdad — are staying at a hotel by the airport. Zuleyka went to school in San Juan — now she's living in Orlando with her grandfather. Both girls are continuing senior year at Colonial High School, a public school where more than half of the 240 faculty and staff members have family ties to Puerto Rico, including the principal. The school has already enrolled nearly 100 students from Puerto Rico and the Virgin Islands. Both girls still miss their old schools and their friends and families. Zulekya says she's torn between embracing this new school and being sad about missing her senior year with all her friends from back home. But this is their new reality. At Colonial, there's a lot of attention on going to college. Which is why, a few weeks after they've both settled into their classes, they are called, together, to the college specialist's office. Zuleyka is still struggling a bit with her English, so Yerianne helps translate. They're completely overwhelmed, they say, and have no idea where to start. It's hard to start again, Zulekya says in Spanish. She already did this — back in Puerto Rico — sifting through the college choices, deciding which schools to apply to and studying and taking Puerto Rico's college entrance exam. To do it again, in a new place, she says that it's a lot of work. She is hoping to study biology and then go on to medical school. She's heard good things about the local community college — should she apply there, even though her GPA is high? Will her English hold her back? Yerianne has lots of questions too: When applications ask for her permanent address, should she list the hotel? Or, should she put her stepdad's bother's house in Orlando? She keeps getting emails from a private school she's never heard of — is that worth applying to? She thinks she wants to find a school with a good advertising program, but should she stay in Florida? She's thinking probably, yes. Florida is where some of her extended family lives. In fact, this exodus of the island has been happening long before Hurricane Maria hit. And many of those people have come to the Florida. In fact, the state's Puerto Rican population has more than doubled over the past 14 years, according to an analysis by Pew Research Center. Orlando has been a popular place to land: In 2013, more than 300,000 Puerto Ricans lived in the Orlando metro area, the largest concentration of Puerto Ricans in the state. The counselor shows the girls a list of state schools and helps them log into their online portals so they can search for programs and apply for scholarships. As the girls file out of his office, they seem more optimistic. There are help sessions during lunch and after school. There's a woman who can guide them through the federal financial aid form (FAFSA) next week. And they're both signed up to take the SAT in a few days, a test neither has really had time to study for, but upon which, it feels to them, much of their future depends. "I'm starting to make a plan," says Zulekya. Yerianne nods her head in agreement, "I didn't even know where my path started, and I needed support because I can't do this alone. So, at least he helped me with a place to start." Amid all this, two schools in Orlando awarded both Yerriane and Zuleyka scholarships — so that's lifted some weight off their shoulders. Yerrianne says it gave her a confidence boost too. "The scholarship has definitely alleviated some financial stress," she says. "It makes me feel better, smarter. It confirms that I'm capable of doing everything I set my mind to." Isabel Dobrin, an NPR digital news intern, contributed to this report. We're checking in with two students from Puerto Rico who we met on the program last week. They thought they had their college plans set. Then Hurricane Maria hit. As NPR's Elissa Nadworny found out, they are both having to start over. YERIANNE ROLDAN: My name is Yerianne Roldan. I'm 17 years old. And I'm thinking of becoming a graphic designer. ELISSA NADWORNY, BYLINE: Yerianne came to Orlando a month ago from Puerto Rico, where she's lived her whole life. She and her family are now staying at a hotel by the airport, her, her sister, her mom and her stepdad all in one room. Since coming to the mainland she's made a good friend who's in a similar situation. ZULEYKA: My name is Zuleyka. I'm 17 years old. And in the future I want to be a pediatrician. NADWORNY: Zuleyka went to school in San Juan, and now she's living in Orlando with her grandfather. Both girls are continuing their senior year at Colonial High School. Their class schedules are nailed down. They've made new friends. They even went to homecoming, a high school tradition. Another high school tradition they're experiencing - meeting with the school counselor about next year. BRANDON THOMPSON: I'm assuming you're wanting to do a bachelor's degree, correct? OK.
NADWORNY: Zuleyka and Yerianne are meeting together with college specialist Brandon Thompson. THOMPSON: These are all of the state universities in Florida. NADWORNY: You want to stay in Florida, right, Mr. Thompson asks. They both nod. He pulls out a list of schools to show them. THOMPSON: Gainesville's more north Florida. Tallahassee has FSU. That's more north Florida. You have UCF in Orlando. You have USF over in Tampa. So those are kind of the central ones. NADWORNY: The girls look overwhelmed. THOMPSON: Any questions for me at the moment? THOMPSON: I know. It's a lot. I know. It's a lot. NADWORNY: "It's hard to start again," Zuleyka says. She already did this back in Puerto Rico - sifting through the college choices, deciding which schools to apply to, and studying and taking Puerto Rico's college entrance exam. NADWORNY: "To do it again in a new place," she says, "it's a lot of work." She's hoping to study biology and then go on to medical school. For Yerianne, she says she feels lost when it comes to looking for college in Florida. ROLDAN: I didn't even know where my path started, and I needed support because I can't do this alone. I have no idea. NADWORNY: She thinks she wants to find a school with a good advertising program, but she hasn't even made it through an application. ROLDAN: I was kind of filling out an application yesterday and they were asking for my permanent address. And I don't have one at the moment, so I don't know what to put there. NADWORNY: Should she list the hotel address? Should she put her stepdad's brother's house in Orlando? She keeps getting emails from a private school she's never heard of. Is that worth applying to? There is one thing both girls do know - they have to take the SAT. And so they did. I checked back in with Yerianne to see how it went. ROLDAN: My time management was off. My focus was off. NADWORNY: If only the situation was different, she says. But amid all this two local schools in Orlando awarded both Yerianne and Zuleyka scholarships, so that's lifted some of the weight off their shoulders. Yerianne says it also gave her a confidence boost. ROLDAN: It just confirms what I've always believed in, which is that I'm capable of accomplishing everything I set my mind to. NADWORNY: Elissa Nadworny, NPR News, Orlando. (SOUNDBITE OF BABY BASH AND FRANKIE J. SONG, "SUGA SUGA") Transcript provided by NPR, Copyright NPR.